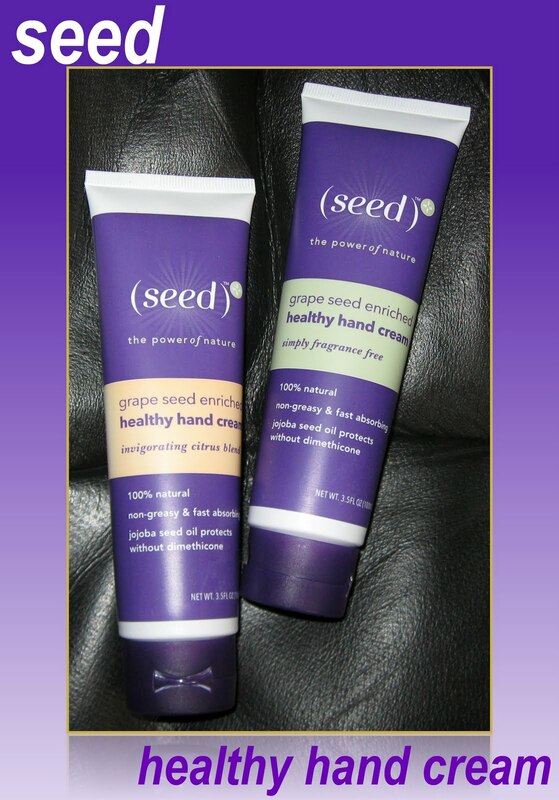 Seed Healthy Hand Cream: Winter-Proof Your Hands! With winter quickly approaching, I'm always on the lookout for hand care treatments that protect against the elements. Seed recently launched a new hand cream that I had the pleasure to review, and it's perfect! The product is called Grape Seed Enriched Healthy Hand Cream. This cream is very rich and thick, yet it absorbs quickly without a greasy residue. You can feel the relief to your hands immediately, and with ingredients like Jojoba seed oil for repelling water and added hydration, it seems to last longer on my hands than many other products. I wash my hands several times throughout the day, and I don't feel the need to re-apply this one. The Healthy Hand Cream also contains Grape Seed oil, which is rich in antioxidants including Vitamin E. If your hands are extremely dry and cracked, the Healthy Hand Cream also contains Aloe for healing. My husband has been using this too, and his hands are noticeably improved. This product is a 100% natural plant-based formula that's Paraben and Dimethicone-free. Seed does not test on animals, and all of their products are made in the USA. Their philosophy, or Seedology states that Everything begins with a seed. It’s a fact that a single seed contains all the nutrients that enable life. When you look inside a seed, it’s packed with elements that provide incredible skin health benefits. Our proprietary formulas are developed to deliver the most comprehensive benefits, while delivering an indulgent sensory experience. It’s all inside these tiny seeds – the essence and power to create a healthy life. If you're looking for some healthy and effective skin care products, check out the Seed brand. They also offer a nourishing body lotion, lathering shampoo bar, and a moisturizing body bar. I'm quite certain they'll be introducing additional products in the future. The Healthy Hand Cream retails for $7.99 and is available (on sale for $5.59) on their web site here. Their products are also available at Whole Foods (30% off through 11/2). You can view my reviews on their other products here.